OK Fine Productions is a small, service disabled veteran-owned company that makes the longest lasting training dummies available. 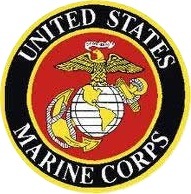 The Original U.S. Manufacturers & Sole Distributors of All-Purpose Training Dummies - Made in America! We offer a 3-year warranty against manufacturing defects! Call (307) 266-4662 or Email your order Today! Legs and back are reinforced with 18oz. heavy gauge vinyl for longer life. 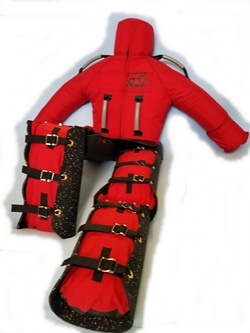 We make the Rugged Red's so well, it may be the last training dummy your department will ever need DUE TO OUR TRIPLE LAYERS OF PROTECTION! We cover the Deluxe Model's back and legs with truck-bed liner! Police and Fire Departments to train in rescue maneuvers such as smoke filled or collapsed buildings, ladder and pole-top carry-down procedures and confined spaces. 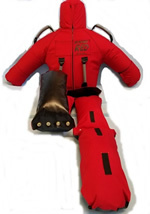 This product will allow you to increase the weight of your Rugged Red Rescue Dummy by extra 25#. Price is $120 + SH. Introducing Econo Man and Econo Kid! Each Regular Red has 1 set of leg protectors to protect when dragging on asphalt. Leg protectors attach to legs and can quickly be removed when not needed. Protectors are made of recycled rubber to give a natural feel when dragging. We cost a bit more due to the cost involved in making our products. 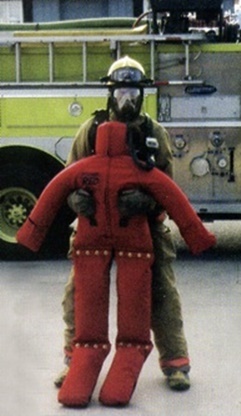 Rest assured you are getting the most durable and long lasting training dummies available! Regular Rugged Red with recycled rubber leg protectors for dragging on asphalt, etc. 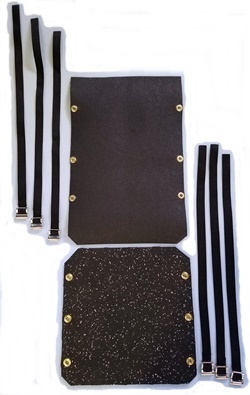 Set of full leg protectors $99. First full set of leg protectors FREE with purchase of Regular Rugged Red Option #1! 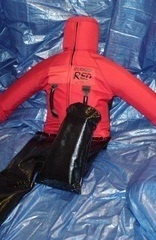 Drag Harness comes with Rugged Red Rescue Dummy purchase. 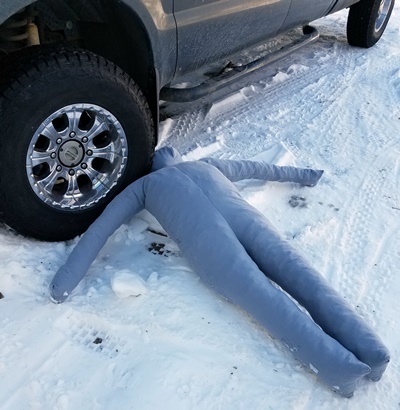 Weighted with sand and foam filler for extra protection, these dummies can be placed flat on their back or in a sitting position. The weight is distributed properly to assure human-like feel. Two pockets on the front for thermal imaging training capabilities. All that is necessary is inserting hand warmers into the pockets. Replaceable mittens to protect hand areas. Handles on chest and shoulders for better gripping and control. 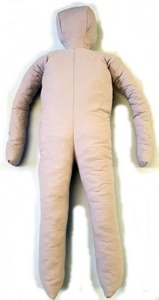 Can be placed in a sitting position or flat on his back. Has a heavy hose inside to give the arms a sturdy feel and prevent pinching when lifting for dragging. The lower legs are 2 pieces joined together with fasteners that are easy to remove for replacement. Removing lower legs can decrease weight by 25 lbs. Legs are reinforced with heavy weight vinyl to give your high-wear areas lasting protection. Or you have the option of sprayed truck-liner on the back of the legs and torso. with each Rugged Red Option #1! * 3-Year Warranty is NOT applicable to Econo Man and Econo Kid. 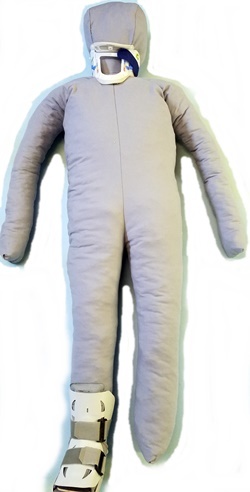 A light weight adult or kid-sized training dummy that won't break the bank. Great for disaster scenarios such as search and rescue or mass casualty training situations. Dummy color is a charcoal grey 15 oz. fabric. Made with a foam filler. Clothes are not included. Push Econo Man from 3rd story, run him over or bury him in a collapsed buidling! Buy a 4 pack of Econo Man and Save! OK Fine Productions is a Service Disabled, Veteran-Owned Small Business. We can provide a sole source letter for our business and are registered on the SAM. Our Duns Number is 019684088. 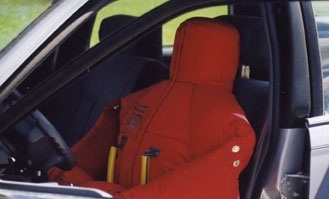 Shown above and below is the Rugged Red Extrication model with folding arms. Rugged Red is built to last with reinforced stitching and rugged fasteners. Above is the Extrication Model, option 2, with articulating arms. Rugged Red Option 1 with vinyl covering on back. Rugged Red Option 2 with Truck Bed Liner upgrade on back. 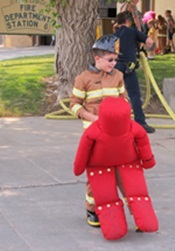 "Our Sheriff's Office has been using the Rugged Red drag dummies for several years now and we have been thrilled with their durability. We went through several brands prior to using the Rugged Red and they were destroyed during our training and physical fitness qualifications. We have several variations of the Rugged Red dummies now and they have all held up flawlessly throughout our very harsh treatment. The 25lb weight belt provided by OK Fine Productions has helped safely change our drag dummy weight and is just as robust and reliable as the Rugged Red. Training dummies are essential for helping keep our deputies in shape and prepared for real life emergencies and these are hands down the best we've used. I can't speak highly enough about the help and service provided by OK Fine Productions...buy from them with ABSOLUTE CONFIDENCE."